Happy Monday everyone. I hope you are feeling refreshed and ready to start a new week. I know that many of you in the US are still (im)patiently waiting for spring to arrive but round here, it's all systems go and as my hay fever eyes and nose will tell you, nature is bursting forth! I had something else to inspire us this week but when I saw the image below on Facebook a few moments ago, I just knew that this would be my prompt. 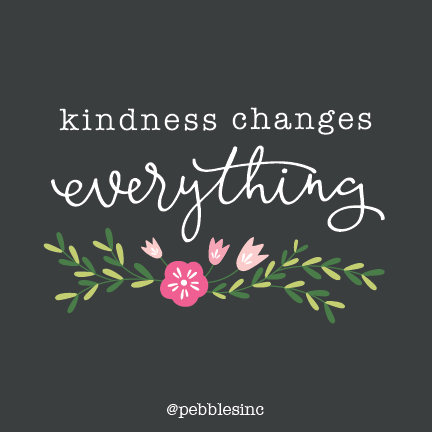 I'd like you to be inspired by "kindness changes everything". A small act of kindness can go a long, long way. It can change the way you think about that person, a whole situation or even the world at large. It can make you see things in a clearer way, maybe more positive or even a little more self-reflective. You might be one acting kindly, or the grateful recipient of someone else's thoughtfulness. You might wish to work on becoming a kinder person or thinking about how to install that attitude in those around you. Many ways to approach this. You might even have some product with a similar quote that you'd like to use on your project. 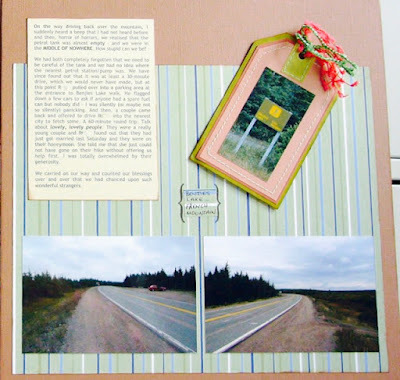 Many years ago when I first started scrapbooking, we had a wonderful Nova Scotia adventure which became the topic of a huge scrapbook album. I had just started my blog and every day while we were there, I'd record my thoughts about our trip and that all formed the journalling for this huge project when I came back. One of the stories I told was "Never underestimate the kindness of strangers" and is one of my favourite memories of our trip. My scrapbooking style was rather basic and I'd certainly make the album differently today but this page still warms my heart. (Let's not talk about the randomly tilted tag!!!) In fact, I've just realised that this formed the prompt WM#230 - be inspired by the kindness of strangers but I think we can never have enough kindness in our lives so another prompt, similar but different, is ok!